Mhumhi put his (not THAT round) ears back. The sun was beginning to go down, the endless ocean of sand before them had not shifted, and everyone was beginning to get rather crabby. At first Mini had instructed them to just keep going over the sand, keeping the landmarks of the suburbs directly behind them, but now the dunes had mostly blocked their view, dark silhouettes now in the fading light, with the black blot of the smoke cloud over the city still hovering in the background. Kutta had been the one to insist they stop and get their bearings, saying that trying to keep traveling in a straight line would still probably eventually take them off-course, and anyway, how would they know if the road curved? She and Mhumhi had stopped, and Vimbo too, with the cart. Mini had wanted to keep going. Mhumhi had taken that opportunity to try again to pick a fight. Vimbo, unhooked by Tareq, had wandered a little ways away and was entertaining himself by digging in the sand. “Next you’ll be telling us that’s why you started the fire,” said Mhumhi. Mini’s fur seemed to puff up even more, and her dark little eyes flashed. Mhumhi snapped his jaws in frustration as the bickering went on over his head, and looked over at Vimbo. The hyena was sending up airy plumes of sand as he dug furiously. “I’ve given plenty of-” Mini stopped, for a cascade of sand had just come flying her way, settling in her fur. She stood stock still for a moment, then shook herself with a furious growl. Vimbo’s clownish face popped up from within the sandy ditch he’d dug himself, and he gave a little grunt. “What are you doing?” Kutta asked, sounding curious in spite of herself, and stepped over Mini to investigate. Mhumhi pulled himself up to follow her. They had to dodge another flurry of sand as they approached. Vimbo seemed to really be getting into it, grunting as he lunged down with his forepaws to send up another spray. Mhumhi walked around the edge of the sizable pit, feeling a bit guilty as his footsteps caused sand to trickle back down the sides, and sniffed cautiously. There was nothing special-smelling about the area- to him. He was beginning to suspect that Vimbo’s nose might be more powerful than his own. It was black asphalt, sandy but very visible. Vimbo kicked at the sand around the exposed spot until he had found one straight edge of it. Then he stopped, and looked up at all of them. “He’s found the road!” Mhumhi bounced, sending a small cascade of sand back into the pit, and Vimbo twisted around to stare at him. “It’s a few degrees off,” said Kutta. “-the exact same direction, see, so we might as well get a move on, double-time, to make up for what we’ve lost standing around uselessly.” She fixed Kutta with a bug-eyed stare. Mhumhi saw his sister’s tail bristle. Mini took a vast breath to respond with, swelling herself, but Mhumhi beat her there. “No,” said Mhumhi, “we can look forward.” He jerked his head, and they followed it. Ahead of them there were dark spots in the sand, some with square edges. It had taken some staring, but Mhumhi had finally realized what they were. That had been Mini, who was cocking her head. Mhumhi wagged his tail in the affirmative. Kutta and Mini both stared. Mhumhi was a bit irritated that neither of them looked impressed or satisfied. Kutta’s legs stiffened, and for a moment Mhumhi thought his sister was going to really dig in her heels, but then she gave a little sigh. They got the sleepy, sandy Tareq to hook Vimbo back up, and then they went towards the roofs. It did stun Mhumhi a little, when he stepped from the sand onto the dark red tiles of the roof, that at one point he would have been standing some ten feet off the ground here. He scraped his paw through the sand past the edge, the grains sliding under his nails and between his pads. “Don’t dawdle!” Mini yapped, as the cart passed him by. They were lucky. After a little while, the houses began to protrude out of the sand more and more, as Mhumhi began to feel a slight sensation of going downhill. The neat rows of them were quite visible, though the road was not, buried as it was under six feet of sand. FInally, as the sun was touching the horizon, washing everything gold and red, Kutta stopped. She was standing in front of an open doorway- a doorway now fixed in its open position, for the door was half-buried in the sand. Mhumhi could see sand within the dimness inside the house as well. Mhumhi had no better suggestions than this, and Mini seemed to have grown tired of arguing. She said something to Vimbo and the hyena turned the cart to stare through the doorway. “Mhumhi and I will go first,” Kutta said, raising her tail. Mhumhi felt less keen to investigate. The outside of the house was ominous enough. What was showing above the sand was very dilapidated- there were big cracks in the front wall that were clotted with sand. Similar cracks on all sides gave the place the appearance of bulging slightly outwards. The inside, however, looked positively eerie through the doorway: rooms filled with rippled sand. Kutta was game for it, though, and he supposed the house had stood on it’s own for this long. He followed her through the doorway into the dim, sandy cave beyond. It was queerly silent inside the house, their footsteps muffled by the soft sand. The parts of the walls that were exposed were covered in peeling, faded wallpaper in bright colors. Squares of yellow sunlight were coming in through the windows on either side, lying brightly on the sand. The windows themselves had no glass in them; Mhumhi assumed that they had been shattered and worn away by the ever-pressing sand. The sand did not lay evenly in the house, but rather in waves, so that when they came up to the doorway into the next room Kutta had to dig a little so that they could squeeze through the top. Mhumhi did not enjoy the next room. The height of the sand meant that their heads nearly brushed the ceiling. Kutta was rooting around ahead of him, digging at the next doorway, so Mhumhi stood back in the corner to avoid having sand flung at his face. The sand was at its highest here, and he really had to crouch to fit in. He thought it was an unfortunate choice that the walls in this room were colored pale blue, with clouds on them, so that he could envision that it was just the sky over the sand that he was seeing, except it was a hard, close sky that might crush him. Mhumhi squirmed his way out of the corner and crouched again to follow her through the doorway. There were stairs, their landing deeply buried in the sand- but the top ones only had a light sandy coating, and they led up through a dark gap in the ceiling. “If we can even fit them inside,” said Mhumhi, but he followed her back to the doorway. The cart was a problem, of course, and it did not fit completely through the doorway. Still, they were able to get the front half just up to the wheels through, so that the back part with the awning stuck outside, and Kutta pointed out that this was fine, for it acted like a lid on the door, and prevented sand from trickling into the bottom of the cart. They got Tareq to come out and unhook Vimbo. Mhumhi had known that the problem would be moving Maha, and he was half-inclined to leave her there, resting in the cart, now that it was somewhat sheltered. But much to his surprise, when Tareq had got down she sat up, pushing herself with one shaking arm, and looked around. Maha put a leg over the side of the cart and tumbled out onto the sand. Mhumhi was glad it was soft. He went to her side and let her grab a handful of his fur and skin to lever herself up with. Tareq, who had been huddling next to Vimbo, suddenly cried out. “I don’ like her face anymore!” said Tareq, lips quivering, and then pressed his head into Vimbo’s side. “You apologize!” Kutta said, advancing on him, to his increasingly loud sniffles. Vimbo looked down at the boy clinging to him and seemed, Mhumhi thought, quite at a loss. He looked up at Maha, who was crouching beside him, one hand still painfully gripping his skin. Her swollen face made it hard to tell what her expression was, but her eyes had thinned even more. “Tareq’s a stupid brat,” she said, speech slurred but still scornful. Mhumhi gave a small wag of his tail. 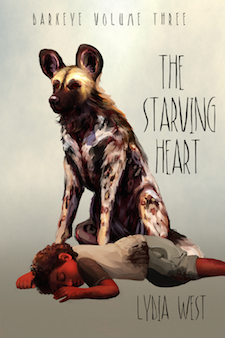 “We found the upstairs,” said Kutta, and took Tareq by the collar of his shirt to drag him away from Vimbo. They managed to get their squabbling little pack to move, bit by bit, through the cramped and sandy doorways and up the stairs. Mhumhi stayed by Maha’s side, watching her with oppressive worry pressing down on his heart like the false-sky ceiling. She was moving almost normally, if stiffly, crawling and crouching through the sand, though she kept her badly bitten arm raised. The pale fabric they had tied around it was now a solid rusty brown color, reeking of blood. She herself bore a stench, not just of blood but of sour flesh, which Mhumhi found more horrifying than her mangled, swollen face. The smell of infection. But she has some energy back, he reminded himself, watching her carefully navigate the sandy stairs, using her good arm to support herself on the railing. With rest and food… with rest and food… wounds often got worse before they got better, wasn’t that true? His scarred rear leg, which he had not given much thought to for some time, gave a little twinge. Maha disappeared up onto the dark landing, and Mhumhi shook the sand out of his fur and followed her. Upstairs there was almost no sand, aside from what they were tracking in. Mhumhi was glad to feel carpeted floor under his paws, though the light was dim, filtering bluish through drawn curtains on the nearest window. Maha walked unsteadily over to them, using the wall for support, and pulled them open. The fading sunlight fell in squares onto the carpet. Kutta and the others were already up there, exploring the rooms, and Mhumhi could hear Mini yapping about something. Mhumhi went to stand by Maha to let her steady herself with a hand on his shoulder, and then walked slowly with her over towards the room Mini was shouting from. It was a peculiar room- very pink, on the walls and the pastel sheets on the bed and in many of the plastic things scattered all over the floor. Mhumhi nosed a few of them, bewildered, because it was really quite a spread. There were pink things he thought were cups and plates, and other things that looked like miniature plastic dogs, and hulkers- the little plastic hulkers had hair coming out of their heads and open glassy eyes. “Toys!” exclaimed Tareq, who was sitting in the middle of the floor with his eyes wide and his hands full of plastic. When he saw Maha, however, his face screwed up again. “Look at this, Tareq,” Kutta said quickly, and she trotted over to him with something soft in her mouth. Mhumhi tried to figure out what it was when she dropped it. It looked all the world like a fat, puffy, dead dog, except there was nothing like a life-smell or a meat-smell coming from it, only a vague fiber scent. “Dog,” said Tareq, and he dropped the plastic things he was holding and picked up the soft dog-not-dog to himself. Maha let go of Mhumhi and went by herself over to where Kutta had come from, because there was a small pile of other limp soft things, not all of them entirely doglike. In fact, Mhumhi was not sure what most of them were. Maha picked one out of the pile and considered it for a moment, then put it back down. “Come here, girl,” yapped Mini, who was a dark furry lump on the bed. 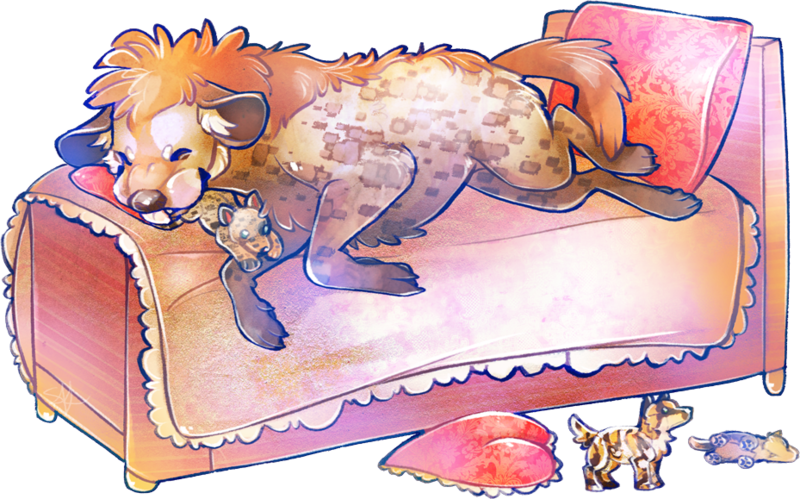 Mhumhi was amused to see Vimbo splayed out on the pink bedspread behind her, his massive hairy self nestled in a pile of frilly pillows. Maha went over to Mini, seeming wary- Mhumhi couldn’t actually remember if the two had been formally introduced. Mini stood up on the bed and sniffed Maha’s chest, rearing up on her hind legs. “Hug me now,” she said, and to Mhumhi’s surprise Maha picked her up in her arms and held her against herself. Maha turned and sat down on the bed, holding Mini dangling in one arm for a moment before squashing her down into her lap. Mini seemed quite pleased to be so manipulated, opening her mouth to let her tongue hang out in a smile. “I’ve never liked stuffed animals,” she said. Maha scratched Mini’s ears, and Mini didn’t let up her smile. “You are ridiculous,” Kutta said, staring up at them, an expression on her face that made Mhumhi suspect she was having similar sentiments that he was. Maha said nothing, just kept scratching Mini’s ears. Behind her Vimbo stretched out his legs and sank deeper into the pillows with a sigh. It was nearly dark by the time Mhumhi and Kutta had made several trips to lug some of the boxes and cans of food from the cart up to the room for the evening meal. The children could rip open the boxes themselves, but for the cans they made use of Vimbo’s broad jaws. Inevitably they would crush the cans, causing the contents to ooze out on either side, which was very messy. Luckily there were many tongues present to help lick the carpets and floors clean. Mhumhi still found the boxed stuff too dry and unpalatable to bother with, but he did take interest in the canned things. Mini described the lumpy, soupy brown stuff as “some kind of squished legume” and the fatty-tasting salty stuff as “meat, possibly, at some point.” There was also a can of fruit, which Mhumhi recalled from the bouda’s lair, and let Tareq and Maha take care of by themselves. He was pleased to see that Maha had a bit of an appetite. She fell asleep soon after eating, lying on the pink bed with Mini still nestled in her arms, Vimbo on her other side. Mhumhi thought a stranger picture had never existed. Tareq stayed awake for a little while and played on the floor with some of the plastic things in the last few motes of sunlight left. Mhumhi watched him waving the plastic dogs and hulkers and muttering to himself as if it was some sort of incantation. He himself did not realize when he fell asleep, but he woke up some time later when it was still very dark. There was a liquid gleam of moonlight coming in through the window, stained pink from the drawn curtains. There was a sort of pain in Mhumhi’s back, a poky feeling, and he rolled over, dislodging the sharp-edged plastic thing that had been underneath him. His paws brushed against Kutta’s warm side, and he heard her snoring softly. That was Maha’s voice, and he saw her dim silhouette over in the doorway. He got to his feet, stepping gingerly though the plastic minefield, and padded over to her. “My arm hurts,” she whispered. Mhumhi pushed his side against her legs, and felt her fingers curl into the fur around his neck. “Look at this,” she said, tugging at him. They moved out into the hallway, by the curtains Maha had drawn earlier, and Mhumhi saw at once what she had wanted him to see. The dark night sky was rich with stars, spilling out over the purple-blueness like shining pinpricks. Mhumhi put his paws on the sill to look out, eyes wide. “There’s no city lights out here,” Maha whispered. Mhumhi looked out over the dimly-lit sand, waves and dunes and the dark jutting squares of half-buried houses. There was no movement outside, and a queer silence, marred only by Kutta’s snoring from the other room. Mhumhi looked pack at her, forepaws still resting on the sill, and realized that they had never actually bothered to explain the nature of their journey to the children. He got down. Maha’s puffy eyes flicked down to him. He stopped. There was wetness trickling over Maha’s cheeks. “I’m scared of dying,” whispered Maha. He was quivering as much as she was. She tried to scrub at her cheeks, but it seemed too painful, and she dropped her hand. Mhumhi stared at her, and she gripped her injured arm with her other hand. He moved closer to her, to press against her legs again, feeling almost hesitant. “I thought you were angry with me,” he said. When she trailed off, Mhumhi nipped her, lightly. “I’ll sleep on top of Vimbo if I have to,” Mhumhi said, and Maha gave a raspy giggle. They went back into the room together and got onto the bed. Mhumhi did not have to sleep on top of Vimbo, though they did disturb Mini, who grumpily resettled herself between them. The next morning the foul smell coming off Maha’s wounds was worse, and when they tried to feed her from one of the boxes, she threw up, soiling the pale pink carpet. “You’re all right,” Mhumhi kept telling her, mindful of Kutta’s worry and Tareq’s sobbing behind him. They reassembled themselves back in the cart. Mhumhi and Kutta took their turn in the traces, while Vimbo loped behind. Everybody seemed to be somewhat strained and quiet, except Mini, who seemed to have woken up quite cheerful. Mhumhi wasn’t sure about the legitimacy of that assessment, but he did urge himself on faster, stretching his legs, impatient with Kutta’s shorter gait. They moved swiftly over the sand, leaving narrow wheel tracks and pawprints behind. The wind was stronger than it had been the day before, and whirling sand was everywhere in the air, battering against the cloth top of the cart, making them have to squint against it. The houses were getting further and further apart, and there was more and more of that empty space, pale brown sand under an empty blue sky. Mhumhi would have kept moving, assuming it was simply Vimbo’s way of letting off steam, but Kutta stalled and he forced himself to stop, half-turning the cart with his extra momentum. He was able to see that Vimbo had stopped, and was looking back the way they had come, ears pricked. “What’s he going on about?” Kutta asked, twisting to try and look back at Mini. “How many times should I tell you that I don’t speak hyena?” Mini said, sounding irate, but said something to Vimbo in hulker. He seemed to get quite excited, jumping and thrashing a bit on the sand. “Oh, look, there, I see it!” cried Kutta. “What?” Mhumhi craned his neck, putting his head over hers. In the distance, on the line that cut between the brown sand and blue sky, he could see a dark speck. It was moving, Mhumhi realized, and in a decidedly familiar pattern. She trailed off. The black speck was growing larger, still in that familiar lope, and it was obvious that it was getting closer. “Let’s keep moving,” said Mini. Mhumhi! Stop picking fights with Mini. She’s trying to help. ““We could miss our by a few feet” miss our what? “she was having similar sentiments that he was.” sentiments similar to his?